Mazuri Alpaca UltimatE was developed with a leading alpaca veterinarian & nutritionist, Dr. Norm Evans. This diet is a pelleted supplement designed to provide the necessary nutrients for showing, growing, gestating and lactating alpacas. Contains beet pulp – An excellent source of digestible fiber. No distillers dried grains and solubles – May reduce risk of mycotoxin contamination. Fortified with vitamins and organic minerals – Enhances bioavailability. 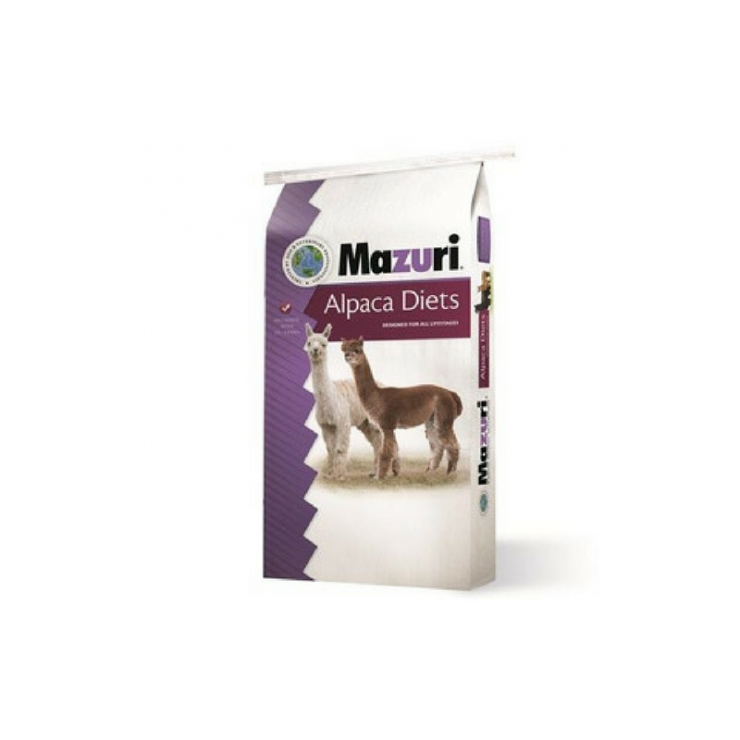 Mazuri® Alpaca UltimatE® contains 2.25 oz of Mazuri® Fiber Enhancer® Supplement per pound of diet. This diet is to be fed with free-choice tested hay or pasture*. In order to meet NRC recommendations for new world camelids, animals being fed hay should consume this product at a rate of 0.5% of body weight or more. Animals on fresh pasture should consume this product at a rate of 0.25-0.33% of body weight or more. 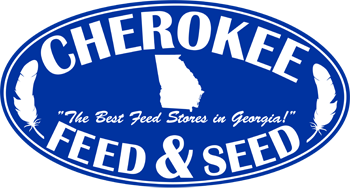 Daily feed amounts should be divided between two feedings. Always provide access to clean, fresh tested water. Additional supplementation may be provided if desired by utilizing Vitamin/Mineral Blend E® as directed by your veterinarian or nutritionist. Caution – Follow label directions: Feeding added selenium at levels in excess of 0.3 ppm in the total diet is prohibited. * We recommend that pasture and hay be tested regularly for Protein, Fat, Fiber and Minerals. This diet is formulated to complement forages that test 4-15 ppm Copper. For best results, store contents of open paper sack in container with sealing lid. Store in a cool (75°F or colder), dry (approximately 50% RH) location. Freezing will not harm the diet and may extend freshness. Use within 1 year of bag manufacturing. Wheat middlings, ground soybean hulls, ground corn, dried beet pulp, flaxseed, cane molasses, monocalcium phosphate, dicalcium phosphate, yeast culture, calcium carbonate, dehulled soybean meal, calcium lignin sulfonate (pelleting agent), salt, zinc proteinate, soybean oil, calcium propionate (a preservative), dehydrated alfalfa meal, dl-alpha tocopheryl acetate (source of vitamin E), manganese proteinate, thiamin mononitrate, apple flavor, niacin, selenium yeast, mixed tocopherols (preservative, form of vitamin E; citric acid, rosemary extract), calcium sulfate, l-ascorbyl-2-polyphosphate (stabilized vitamin C), manganese sulfate, choline chloride, vitamin A acetate, copper chloride, beta-carotene, calcium pantothenate, biotin, cobalt proteinate, niacin, cholecalciferol (vitamin D3), riboflavin, vitamin B12 supplement, calcium iodate, iron proteinate, pyridoxine hydrochloride, sodium selenite, menadione sodium bisulfite complex (vitamin K), folic acid. Caution - Follow label directions: Feeding added selenium at levels in excess of 0.3 ppm in the total diet is prohibited. DO NOT FEED TO SHEEP DUE TO HIGH CONCENTRATIONS OF SUPPLEMENTAL COPPER. * We recommend that pasture and hay be tested regularly for Protein, Fat, Fiber and Minerals. This diet is formulated to complement forages that test 4-15 ppm Copper. Storage Conditions For best results, store contents of open paper sack in container with sealing lid. Store in a cool (75°F or colder), dry (approximately 50% RH) location. Freezing will not harm the diet and may extend freshness. Use within 1 year of bag manufacturing.